Israeli forces continued to use excessive force against the peaceful protestors in the Gaza Strip. 115 civilians, including 28 children, 5 women and 3 journalists, were wounded. The injury of 2 of them was reported serious. 4 Palestinian civilians, including 2 children, were wounded in the West Bank. Israeli forces conducted 71 incursions into Palestinian communities in the West Bank and 3 other incursions into the Gaza Strip. 54 Palestinian civilians, including 13 children, were arrested in the West Bank. 12 of them, including 8children, were arrested in occupied Jerusalem. 2 Palestinian young men sneaked via the border fence between the Gaza Strip and Israel. Shooting incidents continued against Palestinian farmers and shepherds in the border areas of the Gaza Strip, but no casualties were reported. 2 civilians were forced to self-demolish their houses. 8 Shooting incidents were reported against the fishing boats in the Gaza Strip Sea. Israeli forces turned the West Bank into cantons and continued to impose the illegal closure on the Gaza Strip for the 13th consecutive year. Israeli forces established 92 permanent checkpoints and 129 temporary checkpoints in the West Bank. 10 Palestinian civilians were arrested at military checkpoints in the West Bank. Israeli violations of international law and international humanitarian law in the oPt continued during the reporting period (04 – 10 April 2019). In the Gaza Strip, the Israeli forces continued to use lethal force against the participants in the peaceful protests organized along the Gaza Strip borders, which witnessed the peaceful protests for the 53rd week along the eastern and northern border area of the Gaza Strip. They also continued to use force against Palestinians protesting against the incursions into the West Bank. In the Gaza Strip, Israeli forces wounded 115 civilians, including 28 children, 5 women and 3 journalists. The injury of 2 of those wounded was reported serious. In the West Bank, Israeli forces wounded 4 Palestinian civilians. As part of targeting the Palestinian fishermen in the sea, the Israeli forces continued to escalate their attacks against the Palestinian fishermen, indicating the on-going Israeli policy to target their livelihoods. During the reporting period, PCHR documented 8 incidents were as follows: 4 incidents off al-Waha resort shore; 2 incidents off al-Soudaniya in the northern Gaza Strip, and 2 off Khan Younis in the southern Gaza Strip. As part of targeting the border areas, on 07 April 2019, Israeli forces opened fire at a number of Palestinians, who were collecting gravels near Sofa Site, east of Shokah in eastern Rafah City. However, neither casualties nor damage to property was reported. The shooting recurred in the abovementioned area on 09 April 2019. On the same day, Israeli forces opened fire at the border area adjacent to the border fence between the Gaza Strip and Israel in the northern Gaza Strip. However, neither casualties nor damage to the property was reported. On 08 April 2019, Israeli forces fired flare bombs in the border area in eastern ‘Abasan, east of Khan Younis, and sporadically opened fire. Later, the Israeli media said that the Israeli forces arrested 2 young men who sneaked via the border fence. On 09 April 2019, Israeli forces opened fire and fired teargas canisters at the shepherds and workers in eastern al-Fokhari village in the vicinity of Sofa Military Site, southeast of Khan Younis. The shooting recurred in the abovementioned area on 10 April 2019. In the West Bank, the Israeli forces wounded 4 Palestinian civilians, including 2 children, in separate shooting incidents. During the reporting period, Israeli forces conducted at least 71 military incursions into Palestinian communities in the West Bank and 4 other incursions into Jerusalem and its suburbs. During those incursions, Israeli forces arrested at least 42 Palestinians, including 4 children, from the West Bank, while 12 other civilians, including 8 children, were arrested from Jerusalem and its suburbs. In the Gaza Strip, on 04 April 2019, Israeli forces moved into eastern ‘Abasan al-Jadidah, east of Khan Younis in the southern Gaza Strip. They levelled lands along the border fence between Gaza and Israel and headed to the south before redeploying along the border fence in front of al-Farahin neighbourhood, east of ‘Abasan al-Kabirah. On 10 April 2019, Israeli forces moved 100 meters to the southern coastal in the northwestern side of Beit Lahia in the northern Gaza Strip. They leveled and combed lands that were previously leveled amidst Israeli sporadic shooting. However, no casualties were reported. On 10 April 2019, Israeli forces moved 50 meters into al-Shokah village, east of Rafah City in the southern Gaza Strip. They levelled lands in front of the Return encampment and later redeployed along the border fence with Israel. As part of the Israeli house demolitions and notices, on Saturday, 06 April 2019, Nabih al-Basti self-demolished parts of his house in al-Wad neighbourhood in the Old City of occupied East Jerusalem, to apply the Israeli Municipality’s decision and to avoid paying the destruction costs and high fines to the Municipality. The abovmentioned civilian said that the Israeli muncpality forced him to demolish the outside walls and ceiling in addition to the pillars in his house in al-Wad neighbourhood next to “House Peace” Hotel. It should be noted that in 2016 he self-demolished his house from the inside, rendering it uninhabitable. On 09 April 2019, Razina Family self-demolished their residential building in Bir’Onah in Beit Jala, to apply the Israeli municipality in occupied Jerusalem and to avoid paying the high demolition costs and fines to the municipality. Walid Razina said that the Israeli authorities handed him a notice from the court that before 10 April 2019 the house of his brother, Ayman Rezeq Razinah and his sons, Rezeq, Mohammed and Saleh shall be demolished or they will demolish and force him to pay the expenses. As part of settlement expansion and house demolitions, on 07 April 2019, the Israeli forces handed 7 families notices to demolish their dwellings, which are mobile houses built of tin plates and shelter 44 persons, in al-Mofqerah and al-Rakiz Kherbas,s outheast of Yata in the southern Hebron. On 08 April 2019, the Israeli Civil Administration distributed notices to evacuate lands belonging to Palestinian civilians in al-Khemar (al-Harayeq) in Batir village, west of Bethlehem. Taysseer Qotash, Head of Batir Municipality said that the Israeli Civil Administration distributed notices among agricultural lands owners in al-Kemar area and ordered them not to enter the lands claiming that these lands belong to the state of Israel. Moreover, the Israeli Civil Administration gave the lands’ owners 30 days starting from the day they received the notices to challenge the decision. During the reporting period, the Israeli authorities issued 3 military orders to seize 1191 dunums from the Palestinian agricultural lands. Two of these orders are about the construction of 2 new settlement roads; one in the northern West Bank and the other in the Southern, while the third order is about closing areas for military purposes. Based on the decisions and the attached road plans clarifying their tracks, the construction of these 2 roads would lead to swallowing up hundreds of dunums of Palestinian agricultural lands as well as the dunums already included in the seizure orders. On 04 April 2019, stones were thrown at the Palestinian cars passing by “Halmish” settlement intersection, northwest of Ramallah. On 05 April 2019, riots were carried put at the entrance to evacuated “Homash” settlement on Nablus-Jenin Street, northwest of Nablus. On 05 April 2019, ‘Orif village, south of Nablus, was raided. On 07 April 2019, 10 olive trees were uprooted in Kerm al-Dough area, east of Yanoun village, east of Nablus. On 08 April 2019, a group of Israeli settlers threw stones at Palestinian vehicles on the Main Street of Jibia village, north of Ramallah. As a result, a Palestinian civilian was hit with a stone to the head. On 10 April 2019, a group of settlers from ‘Ein Yabrud village, northeast of Ramallah, attacked Palestinian cars and wrote slogans calling for killing Arabs on the wall of a house belonging to Mustafa Shehadah and the vehicles. Incursions into Palestinian Areas, and Attacks on Palestinian Civilians and Property in the West Bank and the Gaza Strip. At approximately 00:45, Israeli forces moved into Jenin refugee camp, west of Jenin. They raided and searched several houses, from which they arrested two Palestinian civilians, including a child, taking them to an unknown destination. The arrestees were identified as Mojahed Mahmoud Talal (15) and Mohammad Ayman Nemir Kandeel (21). At approximately 01:30, Israeli forces moved into al-Yamun village, west of Jenin. They raided and searched several houses, from which they arrested Nowar Mazen Nawahda (22) and ‘Omar Kamel ‘Ezzat al-Ja’bari (25), taking them to an unknown destination. At approximately 02:00, Israeli forces moved into Balata refugee camp, east of Nablus. They raided and searched several houses, from which they arrested Mohammad Suleiman al-Dab’ee (22) and Yusuf Salem Hashash (23), taking them to an unknown destination. Around the same time, Israeli forces moved into al-Masaken al-Shabia neighborhood, northeast of Nablus. They raided and searched a house belonging to Na’eem Mohammad Abu Turkey (24) and then arrested him, taking him to an unknown destination. At approximately 02:30, Israeli forces moved into Madama village, south of Nablus. They raided and searched a house belonging to Baraa Wajeeh Qit (21) and then arrested him, taking him to an unknown destination. At approximately 02:40, Israeli forces moved into Kobar village, north of Ramallah. They raided and searched two houses belonging to Khaldoun Rawhee al-Bargouthi (24) and Yasser Ibraheem Fahel (22) and then arrested them, taking them to an unknown destination. At approximately 04:00, Israeli forces moved into Na’leen village, west of Ramallah. They raided and searched a house belonging to Ahmad al-Habazy (27) and then arrested him, taking him to an unknown destination. At approximately 05:30, Israeli forces moved into Qabatiya village, south of Jenin. They raided and searched a house belonging to ‘Ezz al-Deen Hassan Mahmoud Kameel, which is located in the eastern neighborhood, and then confiscated money estimated at NIS 5600. After that, the Israeli forces raided a house belonging to Islam Nassry Abu al-Rab, which is located in al-Damouni Mount area, and then confiscated money estimated at NIS 2210. Furthermore, the Israeli forces raided and searched Ibraheem Mohammad Hussien al-Sweity, which is located in al-Zakarna Mount area, and then confiscated money estimated at NIS 1510 under the pretext of “funding terrorism”. The Israeli forces handed the three civilians a warrant for their confiscated money. At approximately 07:45, Israeli gunboats stationed off al-Sodanya shore, west of Jabalia, north of the Gaza Strip, chased and heavily fired sound bombs and live bullets at Palestinian fishing boats sailing within three nautical miles. As a result, the fishermen fled for fear of their lives and no injuries or damage to the boats were reported. At approximately 08:00, Israeli forces backed by several military vehicles moved around 100 meters into the east of ‘Abasan al-Jadida, east of Khan Yunis, south of the Gaza Strip. The military vehicles combed and leveled lands along the border fence with Israel towards the south. Few hours later, they redeployed along the border fence adjacent to al-Faraheen neighborhood, east of ‘Abasan al-Kabira. At approximately 08:35, Israeli gunboats stationed off al-Waha shore, northwest of Beit Lahia, north of the Gaza Strip, chased and heavily fired sound bombs and live bullets at Palestinian fishing boats sailing within approximately two nautical miles. Moreover, the shooting at the Palestinian fishing boats in the same area recurred at approximately 18:15. As a result, the fishermen fled for fear of their lives and no injuries or damage to the boats were reported. At approximately 14:30, Israeli forces moved into Jalazone refugee camp, north of Ramallah. They heavily deployed in the camp and sporadically fired rubber bullets, sound bombs and tear gas canisters. As a result, a 16-year-old child was hit with a sound bomb shrapnel. At approximately 19:00, Israeli forces moved into ‘Azzun, east of Qalqilya. They raided and searched a house belonging to Yazzan Ahmad ‘Omar Qattash (19) and then arrested him, taking him to an unknown destination. Note: During the aforementioned day, Israeli forces conducted (12) incursions in the following areas and no arrests were reported: ‘Anabta and Kafr Rumman villages, east of Tulkarm; ‘Awarta, Salem, Buirn, and Sebastia villages in Nablus; Beit ‘Ummar and Karma villages and al-‘Aroub refugee camp in Hebron; ‘Arora village, northwest of Ramallah, Birzeit, north of the city, and al-Balou’ neighborhood, north of al-Beira. At approximately 02:00, Israeli forces moved into Sarta village, northwest of Salfit. They raided and searched a house belonging to Mohammad Khaled Mahmoud al-Khateeb (57) and then arrested him, taking him to an unknown destination. At approximately 22:00, Israeli forces backed by several military vehicles moved into Mothalath al-Shuhada village, south of Jenin. Meanwhile, Palestinian young men gathered and threw stones at the Israeli military vehicles. The Israeli forces immediately fired live and rubber bullets and tear gas canisters at them. As a result, a 17-year-old child was hit with a rubber bullet to the head and then transferred to Martyr Dr. Khalil Souliman Governmental Hospital in Jenin to receive treatment. Note: During the aforementioned day, Israeli forces conducted (9) incursions in the following areas and no arrests were reported: Qalqilya; Ya’bad, ‘Araba, Qabatia villages in Jenin; Burin village in Nablus; and Dura, Yatta, al-Karmel and Sa’ir villages in Hebron. At approximately 20:00, Israeli gunboats stationed off Khan Yunis shore, south of the Gaza Strip, chased, opened fire and pumped water at Palestinian fishing boats sailing within the allowed sailing area. As a result, the fishermen fled for fear of their lives and no injuries or damage to the boats were reported. Note:During the aforementioned day, Israeli forces conducted (3) incursions in the following areas and no arrests were reported: Bani Na’eem and Sa’ir villages and al-‘Aroub refugee camp in Hebron. At approximately 01:30, Israeli forces moved into Dura, southwest of Hebron, and stationed in Abu al-Kamara Valley area. They raided and searched a house belonging to Hamza Moussa al-Darabee’ (24) and then arrested him, taking him to an unknown destination. At approximately 03:30, Israeli forces moved into Sa’ir village, north of Hebron. They raided and searched a house belonging to Mohanad Mahmoud Jadradat (24) and then arrested him, taking him to an unknown destination. At approximately 11:00, Israeli forces stationed along the border fence with Israel, east of al-Shoka village, east of Rafah, fired live bullets and tear gas canisters at Palestinian civilians, who were collecting gravel, near Sofa military site, and no injuries were reported. At approximately 12:00, a group of Israeli undercover “Musta’ribeen” units, dressed like Palestinian civilians, sneaked into al-Sawiya village, south of Nablus, by a car with a Palestinian registration plate. The car stopped at Ramallah-Nablus Street intersection, leading to the adjacent village of Qabalan. The unit’s members stopped a Palestinian car and arrested the driver, taking him to their car and then withdrew. Following that, Israeli forces arrived at the area and confiscated the car, taking it to an unknown destination. After that, it was found that the arrested civilian namely Ahmad Moussa Dwoud Sa’eed (30), from Qabalan village, had driven his parents to al-Samawia village and was arrested by a “Musta’ribeen” unit on his way back. At approximately 12:05, Israeli forces stationed in watchtowers at Beit Hanoun (Erez) crossing, northwest of Beit Lahia, north of the Gaza Strip, sporadically opened fire at the border area along the border fence with Israel. It should be noted that no injuries or damage to property were reported. At approximately 19:10, Israeli gunboats stationed off al-Sodanya shore, west of Jabalia, north of the Gaza Strip, chased and heavily fired sound bombs and live bullets at Palestinian fishing boats sailing within three nautical miles. The shooting lasted until 21:30. As a result, the fishermen fled for fear of their lives and no injuries or damage to the boats were reported. At approximately 02:00, Israeli forces moved into Tulkarm. They raided and searched a house belonging to al-Qassem Riad Mohammad Badeir (31) and then confiscated his cell phone. Meanwhile, the Israeli forces raided and searched a house belonging to Basel ‘Assem Abul Lateef ‘Eid Soboh (20). The Israeli forces then withdrew and arrested both civilians, taking them to an unknown destination. Around the same time, Israeli forces moved into Abu Katila neighborhood in Hebron. They raided and searched two houses belonging to ‘Omar ‘Abdul Mahdi Shawer (23) and ‘Ammar Mohammad al-Qawasma (22) and then arrested them, taking them to an unknown destination. At approximately 02:30, Israeli forces moved into Jenin refugee camp, south of Jenin. They raided and searched several houses, from which they arrested Mohammad Mustafa Qiniry (18) and Ayham Fakhry Saleet (18), taking them to an unknown destination. Around the same time, Israeli forces moved into Jayyous village in Qalqilya. They raided and searched several houses, from which they arrested Saleh Mohammad Nofal (46) and Yazan Ma’en Mohammad Saleem (23), taking them to an unknown destination. Around the same time, Israeli forces moved into Yatta village, south of Hebron. They raided and searched a house belonging to Talal Khaleel al-Najjar (33) and then arrested him, taking him to an unknown destination. At approximately 03:00, Israeli forces moved into Sa’ir, north of Hebron. They raided and searched two houses belonging to Bassam Hejazi Jaradat (30) and Mohammad Marwan Jaradat (28) and then arrested them, taking them to an unknown destination. Around the same time, Israeli forces moved into al-‘Aroub refugee camp, north of Hebron. They raided and searched a house belonging to Yazan Mohammad al-Rai’ee (19) and then arrested him, taking him to an unknown destination. At approximately 03:30, Israeli forces moved into al-Beira and stationed in al-Shurafa, east of the city. They raided and searched a house belonging to Tariq Khdaira (19) and then arrested him, taking him to an unknown destination. At approximately 04:00, Israeli forces moved into al-Nabi Saleh village, northwest of Ramallah. They raided and searched several houses, from which they arrested Mohammad Bassem al-Tameemi (15) and Moayad (20), taking them to an unknown destination. Around the same time, Israeli forces moved into Beit Sira village, west of Ramallah. They raided and searched a house belonging to ‘Ali Mohammad Abu Safia (16) and then arrested him, taking him to an unknown destination. It should be noted that Abu Safia was hit with a rubber bullet to the leg on 08 March 2019 during clashes erupted with the Israeli forces in the village and he is still under treatment. Around the same time, Israeli forces moved into Silwad village, northeast of Ramallah. They raided and searched a house belonging to ‘Abdul Fatah Mustafa Hamed (24) and then arrested him, taking him to an unknown destination. At approximately 08:10, Israeli forces moved 100 meters into the southern coastal border fence off Zikim Military Base, northwest of Beit Lahia in the northern Gaza Strip. The Israeli military vehicles started to level and comb Palestinian lands amid sporadic shooting. At approximately 11:00, the Israeli forces redeployed along the border fence and no injuries were reported. At approximately 08:15, Israeli gunboats stationed off al-Waha shore, northwest of Beit Lahia, north of the Gaza Strip, chased and heavily fired sound bombs and live bullets at Palestinian fishing boats sailing within approximately two nautical miles. As a result, the fishermen fled for fear of their lives and no injuries or damage to the boats were reported. At approximately 8:45, Israeli gunboats stationed off Khan Yunis shore, south of the Gaza Strip, pumped water and opened fire at Palestinian fishing boats sailing within three nautical miles and then chased them. As a result, the fishermen fled for fear of their lives and no injuries or damage to the boats were reported. At approximately 20:30, Israeli forces stationed along the border fence with Israel, east of Khan Yunis, fired flare bombs, east of ‘Abasan al-Jadid, east of Khan Yunis, amid sporadic shooting. Later, Israeli media announced that the Israeli forces arrested two Palestinian civilians while sneaking into Israel and their identities were not revealed. At approximately 21:30, Israeli forces moved into al-Mazra’a al-Gharbia village, north of Ramallah. They patrolled and combed the village’s streets. Palestinian young men gathered and threw stones at the Israeli forces. The Israeli forces immediately fired live bullets, sound bombs and tear canisters at them. As a result, a 23-year-old civilian was hit with a live bullet to the waist and then transferred to the Istishari Arab Hospital to receive treatment. Note: During the aforementioned day, Israeli forces conducted (4) incursions in the following areas and no arrests were reported: Mothalath al-Shuhada village, south of Jenin; Qaryut village, south of Nablus; Halhoul and Tafouh villages in Hebron. At approximately 01:00, Israeli forces moved into several neighborhoods in Heborn. They raided and searched several houses, from which they arrested four civilians, taking them to an unknown destination. The arrestees were identified as Mostafa Mohammad Abu Hussein (25), Anas Salhab al-Tameemi (22), Anas Hatem Qafisha (25), and ‘Omar ‘Abdul Raouf Abu Sninah (27). At approximately 01:30, Israeli forces moved into Ya’bad village, southwest of Jenin. They raided and searched a house belonging to Zeid Ahmad Ba’jawi and then arrested him, taking him to an unknown destination. At approximately 07:00 Israeli gunboats stationed off al-Waha shore, northwest of Beit Lahia, north of the Gaza Strip, chased and heavily fired sound bombs and live bullets at Palestinian fishing boats sailing within approximately three nautical miles. As a result, the fishermen fled for fear of their lives and no injuries or damage to the boats were reported. At approximately 07:20, Israeli forces backed by military vehicles and bulldozers and stationed along the border fence with Israel moved around 50 meters into al-Sahwka village, east of Rafah, south of the Gaza Strip. The Israeli bulldozers leveled lands in front of a Return Camp. At approximately 10:45, the Israeli forces redeployed along the border fence with Israel. Around the same time, Israeli forces stationed along the border fence with Israeli, east of al-Sahwka, east of Rafah, fired live bullets and tear gas canisters at Palestinian civilians, who were collecting gravel, near Sofa military site, and no injuries were reported. At approximately 13:00, Israeli forces stationed along the border fence with Israel, east of Khan Yunis, fired live bullets and tear gas canisters at shepherds and workers, east of al-Fokhary village in the vicinity of Sofa military site, southeast of Khan Yunis, south of the Gaza Strip. As a result, the shepherds and workers fled for fear of their lives. At approximately 19:30, Israeli forces moved into Kifl Haris, north of Salfit. They raided and searched a house belonging to Wajdy Muneer Mufeed Bozeeh (21) and then arrested him, taking him to an unknown destination. At approximately 20:45, Israeli gunboats stationed off western Khan Yunis, south of the Gaza Strip, chased, pumped water and opened fire at Palestinian fishing boats sailing within the allowed sailing area. As a result, the fishermen fled for fear of their lives and no injuries or damage to the boats were reported. Note: During the aforementioned day, Israeli forces conducted (6) incursions in the following areas and no arrests were reported: Jenin; Qabalan village, south of Nablus; al-Fawar refugee camp, Beit ‘Ummar, al-Fawwar refugee camp, Beit al-Roush and Deir al-‘Assal villages in Hebron. At approximately 01:00, Israeli forces moved into al-Dhahiriya, south of Hebron, and stationed in Abu al-Kamara Valley. They raided and searched a house belonging to Qussai Khaled Sa’ada (19) and then arrested him, taking him to an unknown destination. At approximately 02:30, Israeli forces moved into Silat al-Dhahr, south of Hebron. They raided and searched a house belonging to ‘Adnan Khaleel Malahma (53) and then arrested him, taking him to an unknown destination. It should be noted that ‘Adnan is a City Council member. At approximately 20:45, Israeli forces stationed along the border fence with Israel, east of Khan Yunis, fired flare bombs, southeast of Khan Yunis, amid sporadic shooting and no injuries were reported. Note: During the aforementioned day, Israeli forces conducted (5) incursions in the following areas and no arrests were reported: Surif, Beit ‘Ummar, Tarqumia, al-Kum, and Beit ‘Awwa villages in Hebron. Northern Gaza Strip: The Israeli shooting at Palestinian demonstrators, which continued from 16:00 until 19:00, resulted in the injury of 22 Palestinian civilians. Nine of them were hit with live bullets and shrapnel, one with a rubber bullet and 12 were directly hit with tear gas canisters. Gaza City: the Israeli shooting at Palestinian demonstrators, which continued from 15:00 until 18:30, resulted in the injury of 45 Palestinian civilians, including ten children and two women. Thirty-nine of them were hit with live bullets and shrapnel, two were hit with rubber bullets and four were directly hit with tear gas canister. Central Gaza Strip: The Israeli shooting at Palestinian demonstrators, which continued from 14:30 until 18:30, resulted in the injury of 25 Palestinian civilians, including 12 children, two women and a female journalist. Four of them were hit with live bullets and shrapnel and 21 were directly hit with tear gas canisters and rubber bullets. The wounded journalist was identified as Safinaz Baker Mahmoud al-Loh (30), a journalist from Nuseirat working for Amad News Agency, and was hit with a tear gas canister to the right leg. Khan Younis: The Israeli shooting at Palestinian demonstrators, which continued from 16:00 until 18:00, resulted in the injury of eight civilians, including two children and two journalists. The injured journalists were identified as Seif Iyad Sh’aban Abul Ghafour (18), a journalist for ‘Ein News Network, who was hit with a tear gas canister to the right arm, and Mohammad ‘Eissa Mohammad Abu Sa’da (26), a photojournalist at Nour News Network, who was hit with a tear gas canister to the left leg. Rafah: The Israeli shooting at the demonstrators, which continued from 16:00 until 18:30, resulted in the injury of 15 demonstrators, including four children. Four of them were hit with live bullets and shrapnel, three with rubber bullets and eight were directly hit with tear gas canisters. The injuries of two of them were classified as serious. At approximately 13:00, on Friday, 05 April 2019, on Friday afternoon, Palestinian peaceful demonstrators started from the center of Kufor Qadoum village, northeast of Qalqiliyah, the eastern entrance to the village, which has been closed for 15 years in favor of “Kedumim” settlement established on the village’s lands. The demonstrators chanted national slogans demanding end of occupation and condemning the Israeli forces’ crimes against Palestinian protestors along the eastern border of the Gaza Strip within “The Great March of Return and Breaking the Siege” activities. The demonstrators threw stones at Israeli forces stationed behind sand berms. The Israeli forces immediately fired rubber bullets, sound bombs and tear gas canisters at them. As a result, a 24-year-old male was hit with a rubber bullet to the leg. At approximately 16:00, on Saturday, 06 April 2019, Palestinian young men gathered along the annexation wall, west of Qalqiliyah, and threw stones at Israeli forces stationed in the area. The Israeli forces immediately fired sound bombs, tear gas canisters and rubber bullets at them. Moreover, the Israeli forces pursued them and arrested Loay Ibraheem Salman Abu Shehab (17). At approximately 17:30 on Thursday 05 April 2019, Israeli forces established a military checkpoint at the entrance to ‘Ezbet al-Tabib village in Qalqilia. They arrested Mo’men Hesham Mustafa ‘Odwan (31), taking him to an unknown destination. Around the same time, Israeli forces established a temporary military checkpoint at the entrance to ‘Azoun village in Qalqilia. They arrested Mohammed Mashhour ‘Abd al-‘Aziz Salim (23), taking him to an unknown destination. At approximately 18:30 on Thursday, Israeli forces established a temporary military checkpoint on a street connecting between Jayouss and ‘Azoun villages in Qalqilia. They arrested Omar ‘Abdullah ‘Abd al-Latif Redwan (22), taking him to an unknown destination. At approximately 15:00 on Friday, 04 April 2019, Israeli forces at a temporary checkpoint on Nablus-Jenin, south of Jenin, arrested Sayed Ibrahim al-Sayed (23) and Mohammed Jamal al-Sayed (25), from Jenin, taking them to an unknown destination. At approximately 16:00 on Friday, Israeli forces stationed at “Arie” settlement square, north of Salfit, arrested Rostom Jamal Mohammed Abu al-Haija (35), from Marda village, while he was passing by the area, taking him to an unknown destination. It should be noted that Rostom works in the Palestinian National Security Forces. At approximately 17:00 on Friday, Israeli forces established a temporary military checkpoint at the entrance to ‘Ezbet al-Tabib in Qalqilia. They arrested Youssof Ahmed Saleem (30), taking him to an unknown destination. On Sunday morning, 06 April 2019, Israeli forces arrested ‘Issam Ibrahim Mohammed Hamed (34), from Shofa village in Tulkarm, while he was working in his agricultural land near Avnei Hefetz settlement established on civilians’ lands, north of Shofa village. They then took him to an unknown destination. At approximately 10:00 on Monday, 08 April 2019, Israeli forces stationed at Za’tara checkpoint, south of Nablus, arrested ‘Abd al-‘Aziz Bassam Abu ‘Obaid (27), from Jenin, taking him to an unknown destination. At approximately 19:00 on Tuesday 2019, Israeli forces at a temporary checkpoint at Beit Fajar village’s entrance, south of Bethlehem, arrested ‘Ali Youssof Abu Hussain (20), taking him to an unknown destination. At approximately 09:00 on Thursday, 04 April 2019, Israeli police arrested Khader Mohammed al-‘Ajlouni (26) after he opened al-Rahma Gate prayer area’s doors in the eastern side of al-Aqsa Mosque in occupied East Jerusalem’s Old City and referred him for interrogation in one of the detention centers in Jerusalem. It should be noted that Israeli police and intelligence service almost daily carry out arrests on grounds of opening al-Rahma Gate prayer area’s doors after the Israeli Magistrate’s Court issued a decision in last March to extend al-Rahma Gate prayer area’s temporary closure when Palestinian worshipers reopened al-Rahma Gate prayer area closed since 2003. At approximately 15:30 on Thursday, 04 April 2019, Israeli police arrested al-Aqsa Mosque’s guard, ‘Omran al-Ragbi (38) and beat him, while he was in al-Rahma Gate prayer area in the eastern side of al-Aqsa Mosque in occupied East Jerusalem’s Old City. Eyewitnesses said that an Israeli police officer wearing his shoes raided the prayer area though ‘Omran attempt to prevent him from entering and photographed him. The eyewitnesses added that the police officer and others, who were with him, confiscated ‘Omran’s phone took him out of the prayer area and beat him. After that, they tied his hands and took him to an Israeli investigation center. It should be noted that this permanently happens with the Israeli forces who provoke the guards and worshipers and raid the prayer areas while wearing their shoes. At approximately 13:30 on Friday, 05 April 2019, the Israeli police arrested two Palestinian young men after they went out of al-Aqsa Mosque in Occupied East Jerusalem’s Old City. They took the two young men to one of the investigation centers in Jerusalem. The arrestees were identified as Tawfiq Fehmi Abu Dhaim (19) and Ahmed Taysseer Abu ‘Arafa (22). At approximately 21:00 on Friday, 05 April 2019, Israeli forces moved into al-Wad neighborhood in Occupied East Jerusalem’s Old City. They raided and searched a house belonging to Ra’fat Samih Najeeb (31) and then handed him a warrant to refer him to the Israeli Intelligence Service investigation rooms (4) in al-Maskoubia investigation center in the Western Jerusalem. At approximately 23:00, Israeli forces moved into Sour Baher village, south of Occupied East Jerusalem. They raided and searched a house belonging to ‘Issam Mahmoud Mohammed ‘Omaira (69) and then handed him a warrant to refer to the Israeli Intelligence Service in al-Maskoubia investigation center in the Western Jerusalem. At approximately 01:00 on Wednesday, 10 April 2019, Israeli forces moved into al-Mokaber Mount neighborhood, southeast of Occupied East Jerusalem. They raided and searched houses and then arrested Mohanned Zaid Mshahara (17) and ‘Amri Slaiman Mshahara (17), taking them to an unknown destination. At approximately 03:00 on Wednesday, Israeli forces moved into Silwan village, south of Occupied East Jerusalem’s Old City. They raided and searched houses, from which they arrested six children, taking them to an unknown destination. The arrested children were identified as Khader Mohammed ‘Oda (13), Jehad Jawad Abu Rmouz (15), Sultan Maher Sarhan (14), Mohammed Jawad Abu Rmouz (14), and ‘Odai ‘Adnan Ghaith (17). On Thursday afternoon, 04 April 2019, the Israeli District Court issued a decision to demolish four houses belonging to Palestinian civilians in Yassoul Valley neighborhood in Silwan village, south of the Occupied East Jerusalem’s Old City, under the pretext of building without a license on lands, where construction is forbidden. Khaled Shwaiki, Member of the Committee for the Defense of Real Estate in Silwan and member of Wad Yasoul neighborhood committee, said that the neighborhood’s residents try since many years to obtain license for their houses and they tabled construction plans to the competent bodies in light of the population growth in the area but they were refused by the municipality. He indicated that the Israel District Court recently issued a decision to demolish four houses in the neighborhood. He mentioned that these four houses belong to Barqan, al-Qaq and Kashour families and were established in 2000. He said that the fines imposed on these families estimated at more than NIS 100,000 for each house. Khaled added that throughout the previous years, Barqan, al-Qaq and Kashour families tried to obtain licenses for their houses from the competent bodies but their requests were refused. In addition, the Israeli District Court issued a decision to demolish them and it will come into force on 14 April 2019. He also said that the Israeli Municipality claims that the area is classified as “a green land,” where construction is not allowed. Moreover, after the families headed to the municipality during the past years, the municipality gave them only 5 to 12 months to license their houses, noting that the procedures for obtaining a license and transferring the land in to an area where construction is allowed, need more than four years. . Khaled Shwaiki indicated that the neighborhood’s residents have tabled plans to organize the area since 2002 have been in the municipality and different courts fighting for an approval on the tabled plans. He added that the neighborhood includes 84 houses, where more than 400 persons live. At approximately 10:00 on Saturday, 06 April 2019, Nabih al-Basti self-demolished parts of his house in al-Wad neighborhood in Occupied East Jerusalem’s Old City, implementing the Israeli municipality’s decision to avoid paying the demolition’s costs and high fines to the Israeli municipality. Nabih said that the Israeli municipality forced him to self-demolish the outside walls, the ceiling and the rest of the house in al-Wad neighborhood adjacent to House Peace Hotel. It should be noted that in 2016, he demolished his house from the inside so that the house became uninhabitable. He also said that the municipality recently summoned him and ordered him to demolish the rest outside sides of his house under the pretext of vandalizing the heritage of the Old City. Moreover, the municipality gave him the chance to demolish the house until 07 April 2019 or the municipality’s staff would demolish it and so he would be forced to pay the demolition expenses and fines. Nabih added that his house was built on an area of 65 square meters in 1999, and three years ago the municipality issued the final demolition decision after years of delaying and freezing in an attempt to license it. Although Nabih was forced to demolish the house from the inside, he was forced to demolish the outside walls. At afternoon hours on Tuesday, 09 April 2019, Zarina family self-demolished their house in Bir Una area in Beit Jala upon a demolition decision by the Israeli municipality and avoiding paying high fines and demolition expenses to the municipality. It should be noted that several months ago, Israeli forces were pursuing Zarina family to force them to demolish their house. Waleed Zarina said that the Israeli authorities and courts handed him a notice from the court to demolish the 2-storey house comprised of four apartments. The house belongs to Waleed’s brother, Ayman Rezeq Zarina and Ayamn’s sons; Rezeq, Mohammed and Saleh. Waleed said that the court ordered him to demolish the house before 10 April 2019 or it will demolish it and force him to pay the demolition expenses. He added that the Israeli court detained his nephew after he refused to sign the demolition order so his family had to pay NIS 230,000 to release him and implement the decision of self-demolition before 10 April 2019. Waleed indicated that the family hired an Israeli lawyer a year ago after the Israeli authorities’ threat to demolish the house. Large amounts of money were paid to the lawyers, but the court decided to demolish the house. Waleed added that the Israeli authorities threatened the family to demolish all their houses, which belong to Waleed’s brothers; Khaled and Raed. 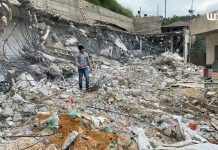 He stressed that the Israeli authorities clearly target Bir Una’s residents as the Israeli authorities demolished a house belonging to him beside demolishing another one a year ago. Moreover, a month ago, the Israeli authorities demolished a house and barracks belonging to Waleed’s cousins; Mohammed and Moussa Zarina. Waleed indicated that the Israeli policy against the area and the family made them sustain great economic losses. Israeli forces continued to target the areas in the West Bank classified as C according to Oslo Accord signed by the Israeli government and Palestine Liberation Organization (PLO) and the areas located in the vicinity of settlements and route of the separation wall in order to expel them from the Palestinian residents for the sake of settlement expansion. A 20-square-meter caravan built of tin plates belonging to Mahmoud Hussain Hamamda and his family comprised of 12 persons. A 20-square-meter caravan built of tin plates belongs to Mohammed Hassan al-Hamamda and his family comprised of nine persons. A 20-square-meter caravan built of tin plates and a 10-square-meter tent belong to Khalil Jaber Hamamda and his family comprised of eight persons. A 20-square-meter caravan built of tin plates belongs to Murad Khalil Jaber Hamamda and his family comprised of five persons. A 20-square-meter caravan built of tin plates belongs to ‘Aamer Khalil Jaber Hamamda and his family comprised of four persons. A 15-square-meter caravan built of tin plates belongs to ‘Adla Khalil Jaber Hamamda. A 20-square-meter caravan built of tin plates belongs to Raed Khalil Jaber Hamamda and his family comprised of five persons. On Monday afternoon, 08 April 2019, the Israeli Civil Administration distributed notices to evacuate lands belonging Palestinian civilians in al-Khemar (al-Haraeq) in Batir village, west of Bethlehem. Taysseer Qotash, Head of Batir Municipality said that the Israeli Civil Administration distributed notices to owners of agricultural lands in al-Kemar area and ordered them not to enter the lands claiming that these are state lands. Moreover, the Israeli Civil Administration gave the lands’ owners 30 days starting from the day they received the notices to challenge the decision. Qotash also said that the Israeli Civil Administration notified a number of farmers to demolish wells under the pretext of non-licensing. He indicated that the lands’ owners have documents proving that they own these lands and the Israeli Civil Administration only aim at seizing as many lands as possible and annex them to the nearby settlement outpost. First: The Howarah Bypass Road: This road starts from the Za’tara checkpoint and ends on the “Yitzhar” settlement Bypass Road, south of Nablus, noting that it will pass through the lands of Bita, Howarah and Burin villages and between the residents’ houses. Israeli sources said, “The construction of a bypass road costs 250 million shekels. This road will be for both the Palestinians and Israelis. The construction works on the road will start upon the completion of Supreme Court’s proceedings, to which the Palestinians are expected to resort to for challenging this order, noting that it might take up to two years to build it.” According to the plans attached to the seizure order, the bypass road will start from Za’tara military checkpoint, pass by Bita Central Vegetable Market, pass through al-Nejma area, pass by Luna Park, and pass through the mountain, which is in front of the water well, towards Howarah village. Second: Al-‘Aroub Bypass Road: This road starts from “Gush Etzion” settlement, south of Bethlehem, and ends in “Karmei Tzur” settlement, south of Hebron, noting that it will pass through the lands of Beit ‘Ummar village, al-‘Aroub refugee camp and Halhoul. The available information about the above-mentioned road indicates that it will isolate al-‘Aroub refugee camp, Beit ‘Ummar village and parts of Halhoul village. Moreover, the road will pass through the most fertile agriculture lands in Hebron, which are famous for growing almonds and grapes. According to the plans attached to the seizure order, the Bypass Road will pass through parts of Khirbet Om Tale’, Khirbet Briqout, Beit Za’ta, Abu Soda Mount, Fredees, al-Forn Mount, al-Sheikh Valley, al-‘Aroub Valley, Beit ‘Ummar lands, Khirbet al-Khaizaran, al-Hawawer, Ras al-Qady, Khirbet Um al-Daraj, Khirbet Beit Khorat, al-Jomjoma, ‘Ein al-Shonnar, Um Suliman, al-Ramouz, Daher al-Bow, Wardan, lands in Halhoul village. Third: Seizure of new lands from Tubas: The Israeli forces issued 2 military orders signed by the IDF Commander in Judea and Samaria, Nadaf Badan. Under the first order, 283 dunums of Tubas lands will be seized while the second order was about seizure of 101 dunums of Tubas, Tamoun and Tayaseer villages. Moataz Bisharat, a Palestinian official who monitors settlement activity in the Jordan Valley/Tubas, said to PCHR’s fieldworker that the two seizure orders included 384 dunums, while the area of lands that will be isolated was about 42,000 dunums, including the communities of Yerza, Ras al-Ahmar, al-Faw Valley, Kherbit al-Mayitah, parts of Khirbet Samra, al-Maleh, and ‘Ain al-Hilweh. He also said that the Israeli forces closed 70% of Tubas and the northern Jordan Valley lands. The area of the closed lands is 200,000 dunums, including 102,000 dunums from Tubas and 98,700 dunums from Tamoun. The closure came under the pretext of being in the military training areas, military zones and nature reserves. It should be noted that the Israeli authorities established 10 settlements, 3 new settlement outposts and 7 camps for the Israeli soldiers in those areas. On Thursday evening, 04 April 2019, dozens of Israeli settlers gathered at the entrance to “Halamish” settlement, north of Ramallah. They started to throw stones at Palestinian cars passing through a square adjacent to the settlement. As a result, throwing stones caused fear among drivers and passengers in the vehicles. No casualties among civilians or damage to their vehicles were reported. At approximately 23:00 on Thursday, dozens of Israeli settlers under Israeli forces protection moved into ‘Otra village, southeast of Nablus. The Israeli settlers performed religious rituals and Talmudic prayers in the village. Next day morning, on Friday, 04 May 2019, they withdrew and no more incidents were reported. At approximately 12:00 on Friday, 05 April 2019, dozens of Israeli settlers under Israeli forces’ protection arrived at the evacuated “Homesh” settlement, northwest of Nablus. They gathered on Nablus-Jenin Street and carried out riots at the entrance to the settlement which continued until the evening. As a result, vehicles started to avoid taking the street due to the Israeli settlers’ attacks against the Palestinian vehicles. At approximately 18:15 on Friday, a group of Israeli settlers from “Yitzhar” settlement established in the eastern side of ‘Orif village, south of Nablus, attacked Palestinian civilians’ houses built in the vicinity of the village. Moreover, dozens of civilians gathered and confronted the settlers by throwing stones at them. As a result, the settlers were forced to withdraw and no casualties were reported. It should be noted that the settlers frequently attack ‘Orif village under Israeli forces protection. At approximately 00:00 on Monday, 08 April 2018, a group of Israeli settlers threw stones at Palestinian civilians’ vehicles on the Main Street of Jebia village, north of Ramallah. As a result, Maher Saber Shalash (26) was hit with a stone to the head and his injury was reported minor. At approximately 02:00 on Wednesday, 10 April 2019, a group of Israeli settlers attacked ‘Ain Yabroud village, northeast of Ramallah. They attacked Palestinian civilians’ vehicles in front of their owners’ houses, in their vicinity and on the village’s streets and wrote slogans against Arabs and Muslims on vehicles and the walls of Mustafa Shehada’s house. The slogans called for killing and defeat Arabs. Moreover, the Israeli settlers used sharp tools in puncturing ten vehicles tires. 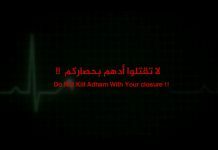 Previous articleDo Not Kill Adham With Your Closure ! !